Last March 19, 2012 I gave quick info on what makes a topic trend on Twitter. It was for the TV program Brigada who did a feature on popular celebrity tandem Julie Anne San Jose and Elmo Magalona. Their fans are active on Twitter using the hashtag #JuliElmo whenever referring to the two. Their fans are also organized in their efforts to make their favorite celebrity pair hashtag trend on Twitter every week. Getting a topic trend on Twitter is not an easy thing, it requires committed people to get it done. In this case, people who share the same passion and are active via Twitter can indeed make a difference. Here are some of the questions I answered at that time. 1. How do we determine what is trending? Is it based on number of tweets, hashtags, usage of a word, etc? Is there a Math formula behind it? According to Twitter, trending topics are discussions that became immediately popular at a short span of time. This usually involves an active discussion among individuals using common keywords or hashtag. 2. How does Twitter empower its users to become star makers? Although not a primary intention, organized users of the tool can plan and execute a communication strategy through it. This includes tweeting with hashtags, what time do discussants go online and tweet, among others. 3. Are fake trends possible? How? Yes, anything is possible. However, with vigilant and active Twitter users, it can be called out. A fake trend can include the use of fake accounts whose only role is to tweet a topic. That is sometimes used to induce a Twitter discussion, particularly retweets. Twitter is watchful to the point it penalizes accounts who abuses this such as tweeting topics that are not related to the hashtag at all – but just to take advantage of it. Users play a role in this regard as each one of us can report an account as spam and block it. 4. 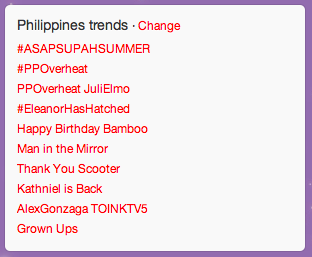 On many occasions, Pinoy topics also trend worldwide. Are we really heavy consumers of Twitter? Around 2.4 million Filipinos are on Twitter. If a huge number of Twitter users are talking about the same topic, regardless of location, then it can indeed trend by country or worldwide for a short while unless more folks from other location join the discussion. We may also have a time-zone advantage. The other side of the world is asleep as we talk about the hot topics of the day. 5. Some say that you are not famous unless you are “Twitter famous”. Do you believe this? Subjective but yes. Am for quality following vs. quantity though. Having a huge following on Facebook can also make you “Facebook famous”. Although Facebook fan pages can be moderated. On Twitter, the fan has power to express themselves until they are blocked by the celebrity being followed. Those who are famous online in the Philippines use a combination of platforms. Some are showbiz personalities, politicians, brands, and companies. 6. What are the ups-and-downs of Twitter for celebrity-fan relationship? On celebrity-fan relationship, it can be fun, heartwarming, and hurtful. Allows artist to keep in touch with their followers and give updates. Fans can also use the same platform to support their idols. In some cases, a venue for interaction if the celebrity is engaging enough. This direct channel can also turn for the worst if the celebrity does or said something that followers don’t like. 7. What do our trending topics say about us? It reflects our social culture. Some use Twitter as an outlet to engage, rant, and validate perspective. Exchange opinions with folks having different point of view. It is a venue for passionate discussion on topics that interest us. As we learn how the tool works, some are able to organize themselves to make topics trend. It is more sensitive though for corporate as users can call it out and challenge it.